Reaching government decision-makers with thought-provoking content should be a priority for any B2G marketer. What format (white papers, podcasts, videos, etc.) do they find most useful and influential and, furthermore, where are they going to get this content? NEW THIS YEAR: As many contractors continue to expand into state and local markets, do the same rules apply as their federal counterparts? How should content be developed and marketed to this audience? Join us as we expand the Federal Content Marketing Review to include state and local decision-makers as well! Discussions for potential applications of artificial intelligence (AI) in the private and public sectors are becoming ever more frequent. Market Connections recently attended Professional Services Council’s Government Affairs Committee AI roundtable on March 1, 2019, featuring Varun Krovi, deputy chief of staff & legislative director for Representative Brenda Lawrence (Dem, MI-14), who together with Representative Ro Khanna (Dem, CA-17) introduced a resolution calling for the ethical development of AI. Did you miss our recent webinar? No problem! The recording is now available sharing insights and data based on our most recent Federal Media & Marketing Study. Understand how the level of confidence federal employees’ have in particular media properties may have a positive or negative effect on your brand and message. Understand how combining confidence with levels of engagement and reach can be an effective measure to make key decisions in the media channels you are choosing to get your message out. 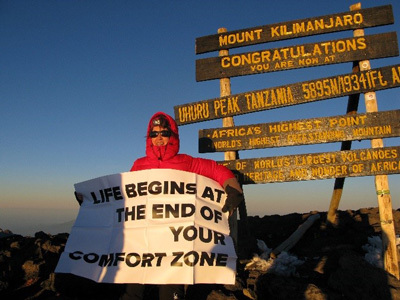 Climbing Kilimanjaro has been one of my major goals and last year I decided to stop talking about it and just get it done. As in other times in my life, it showed me that I could accomplish the high-reaching goals I set for myself by putting in the hard work, training and preparation, and in the end, there is a certain level of exhilaration and awe when accomplishing that goal. As in any difficult endeavor, certain life lessons are brought into sharper focus. Here are a few lessons from the climb that apply to both my business and personal life.